NVT was a British motorcycle manufacturer from 1972 to 1978, formed by the British Government. Triumph had been owned by the BSA Group since 1951, but by 1972 the merged BSA-Triumph group was in serious financial trouble. British Government policy at the time was to save strategic industries with taxpayers’ money. They decided to bail out the company, provided that to compete with the Japanese it merged with financially troubled Norton Villiers, a subsidiary of British engineering conglomerate Manganese Bronze. The merged company was created in 1973. As BSA was both a failed company and a solely British-known brand (the company’s products had always been most successfully marketed in North America under the Triumph brand), the new conglomerate was called Norton Villiers Triumph. NVT inherited four motorcycle factories—Small Heath (ex-BSA); Andover and Wolverhampton (Norton); and Meriden (Triumph). Still short of development cash, the company was restricted to launching developments of existing products, most notably around the popular Norton Commando. With its classical parallel twin probably by now overdeveloped, from March 1973 the Roadster, Hi Rider, and the Interstate all began to use a new 828 cc engine. 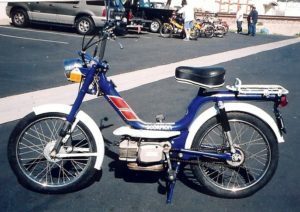 Later NVT also produced the Easy Rider moped including a “sixteener” version with a Morini engine and pedals, and the NVT Rambler 125/175 cc with Yamaha engines. NVT was eventually liquidated in 1978. Even though Norton Villiers Triumph is no more, motorcycles bearing the Triumph name are still being made; the marketing rights to Triumph were sold to the Meriden workers’ co-operative in 1977 and in 1983, sold on to a new Triumph Motorcycles Ltd company situated in Hinckley, Leicestershire. NVT Easy Rider specs: tires 2.25 – 17, engine Morini MO-1 (model ER) or MO-2 (model ER2), weight 110 lbs, total length 66.5″, mono-tube frame gas tank 0.95 gallon, gas tank vent button behind seat, sprockets 12 x 28T. 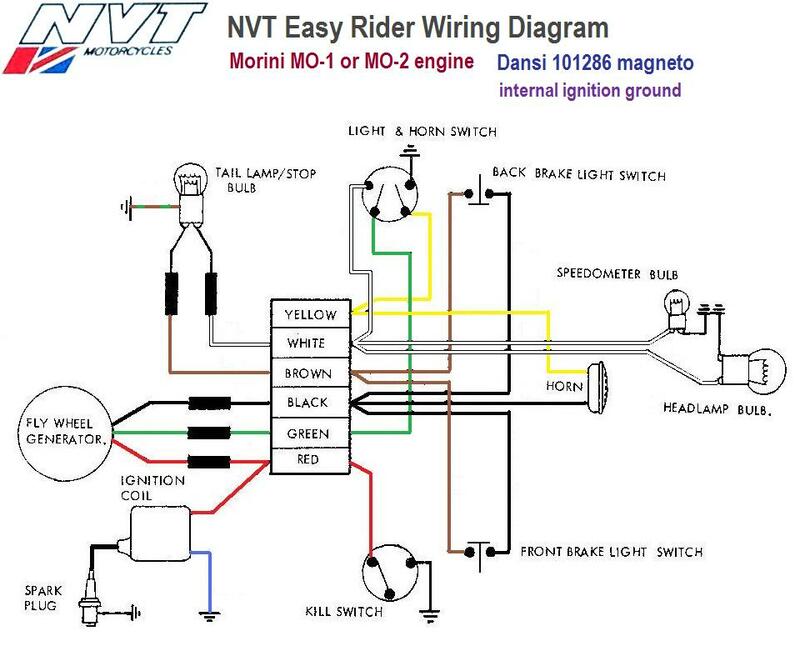 NVT Easy Rider components: Domino 1970’s controls, chrome (stainless) levers, all cables single-ended, Grimeca hubs, 90mm brakes, 11mm axles, Lucas (England) tail light, CEV “bullet” headlight, CEV round chrome switches, brake light switches in parallel, normally open when installed. Some US models have “small” Bosch magneto, dark grey colored flywheel, with internal ignition ground, and a third source coil powering the brake light. Some US models have a Dansi 101286 magneto, gold colored flywheel, with an internal ignition ground. The lighting coil is split into two outputs, so it looks like two source coils but it is actually three. Towards the end of 1977 NVT announced the securing of export orders to the USA of 1,000 Easy Rider mopeds per month. 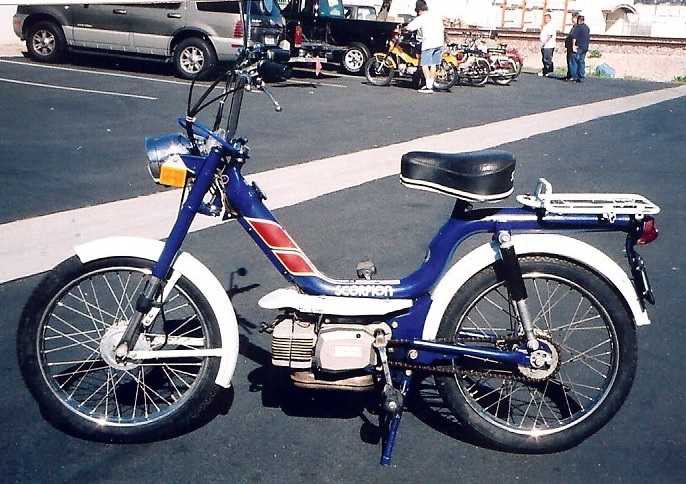 Export market American mopeds were mainly sold as either NVT Easy Rider or, from August 1977, as Scorpion SC1 (step-through frame, single-speed auto), SC2 (step-through frame, two-speed auto), and SC-2X Scrambler models (sports styled, two-speed auto). Frame plates indicated these machines as ‘Manufactured by Scorpion Inc. Crosby, Minnesota’, a snowmobile manufacturer established from 1959, who marketed the mopeds as a product diversification. 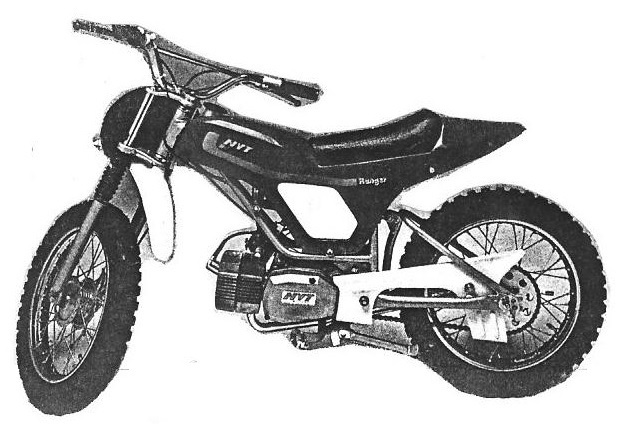 So before August 1977 they were sold as NVT, and after that they were re-branded as Scorpion. 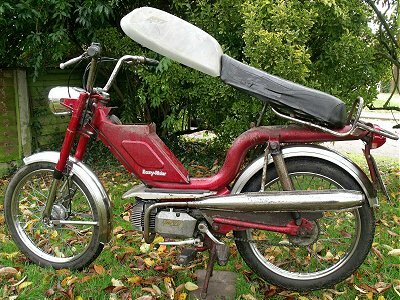 In England NVT also sold top tank mopeds ER2L, ER2P (Morini MO-2), ER2SS, ER4L, ER4TL (Morini MO-4 manual shift). 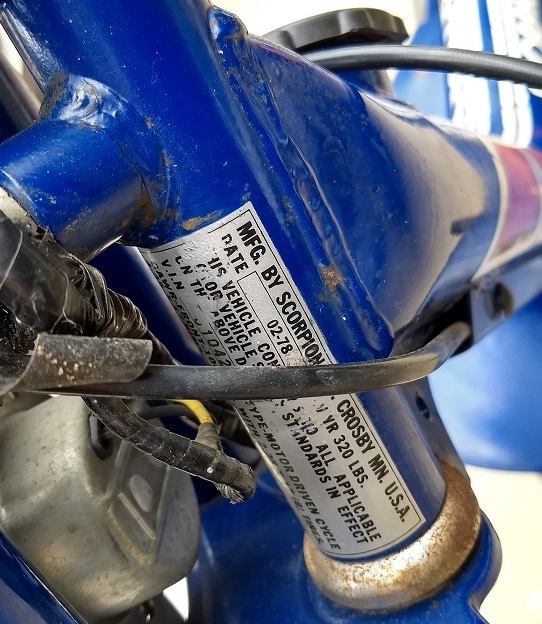 The Scorpion ID plate says “manufactured by Scorpion Inc, Crosby Minnesota USA” but the bike is identical to an NVT made in England. It was made in England but re-branded in Minnesota. 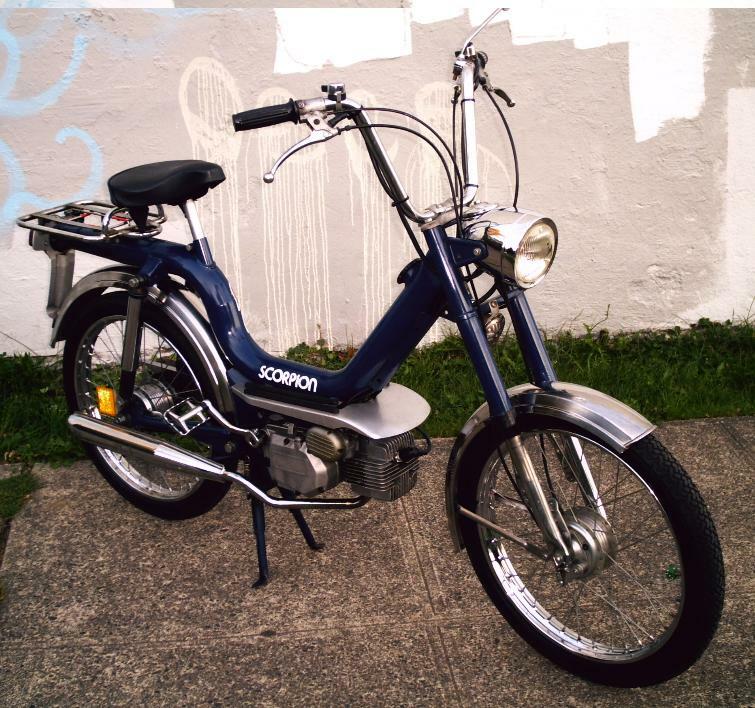 SC1: The Scorpion SC1 had a Morini MO-1 engine, made in Italy, re-branded and labeled as a Cuyana engine. Weight 102 lbs. 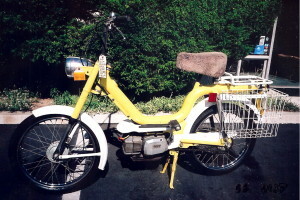 SC2: The Scorpion SC2 had a Morini MO-2 engine, also called Cuyana. Scorpion wanted to hide the true identity of the frame and engine. Weight 105 lbs. 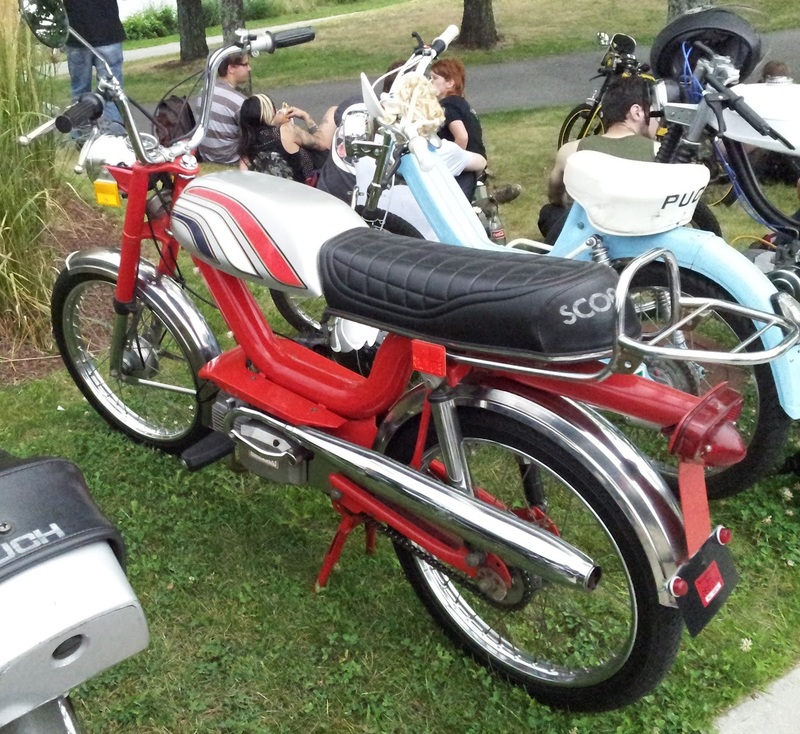 SC2X: The Scorpion SC2X had a Morini MO-2 engine, a top-mount horizontal gas tank, and a long two-person seat with a storage compartment. Weight 113 lbs. 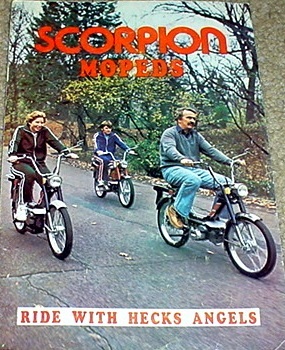 Scorpion mopeds were imported by Scorpion, Inc. Box 300B, Crosby Minnesota USA. Specs and Equipment: tires 2.25-17, fuel mixture 40:1, CEV sealed beam headlight, Lucas tail/stop lamp, steering lock, mirror, luggage rack, speedometer/odometer, Dellorto carburetor with automatic releasing choke. You are currently browsing the archives for the NVT Parts category.